July saw the start of the heaviest work we have done on the house. The outside walls. So not too much dust in the house... hmmmm. Dusty throats need lubrication. Regularly. Scoop and spray. The projector saved time and covered fast. 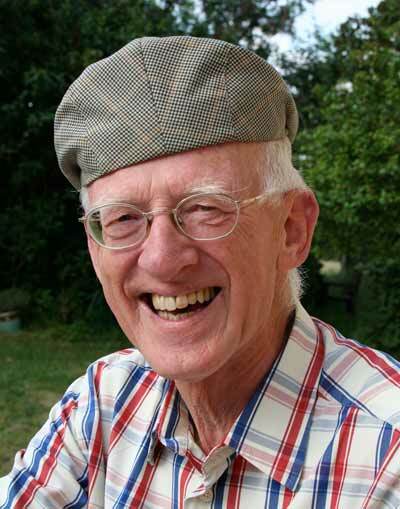 Caroline's uncle Paul drops by for a couple of days on his way back to his home in Portugal. The mother of storms rolls in too quickly for us to react. 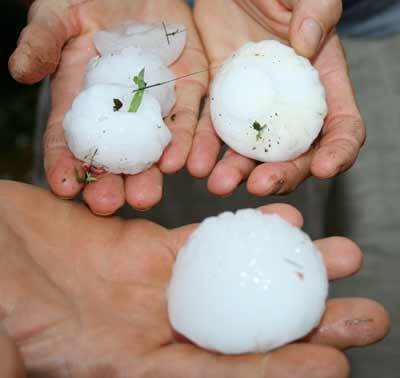 Hailstones the size of mandarin oranges destroyed roofs, cars and crops. Both cars took a severe beating. Almost 8000 euros of damage. Roofs and bonnets (motorkap) were replaced and loads of dents pulled out and resprayed. The vegetable garden became a ratatouille. 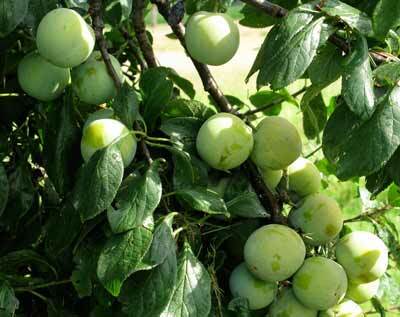 Our fully-laden plum trees photographed the day before. 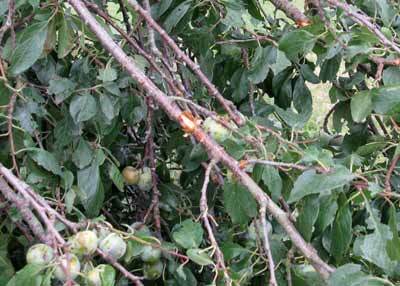 95% of the fruit were removed, split or bruised. 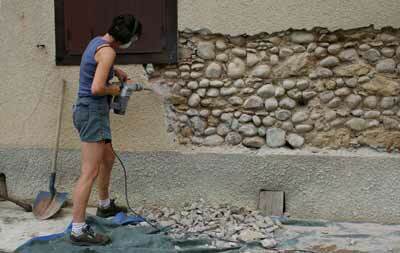 A project that we had long talked about but not gotten round to was the removal of the cement from the outside walls. It involved chipping as much off as possible, covering with chicken wire and then recoating with chalk (chaux) so that the walls could begin to breath again. The details of this operation can be found on Our House, but here's a quick resumé. 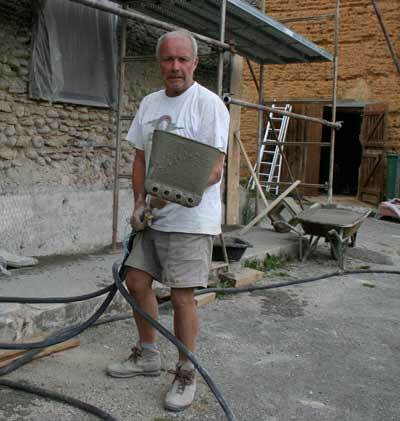 Jean-Pierre, who lives in the village, knows his stuff when it comes to masonry. He comes from Provence, though his family originally came from Puydarrieux. 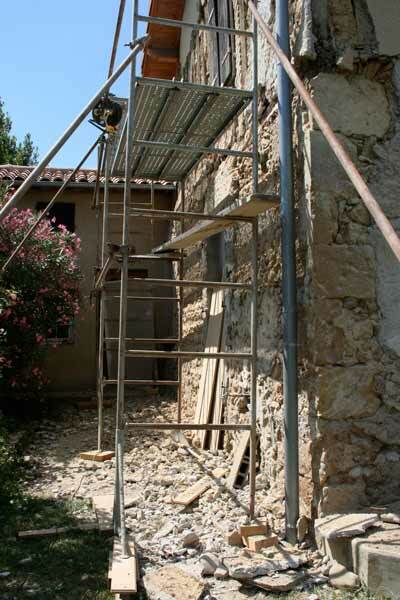 We first chesselled off the cement at ground level, then built the scaffolding and broke the rest off. It took six days, two percussion drills, a couple of cases of beer and untold blisters and back aches. We ended up with enough rubble to use as a base for the terrace that we plan on building, one day. Underneath the cement, we found all sorts of amateur plumbing, brick work and carpentry. 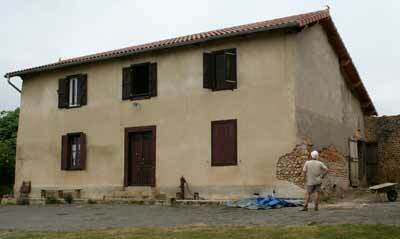 The front of the house, on the right hand side, was built of river stones. The left hand side of mud. Often one will see how houses were built here, in an L-shape. One angle the house, the other the barn. With two rooms nearest to the angle with the barn and a door on the outside, so that later (when more children came, or the farm made enough) two more rooms could be added on the other side. Our house was no different. This is just a taster of the project. To see and read more, go to Our House section. 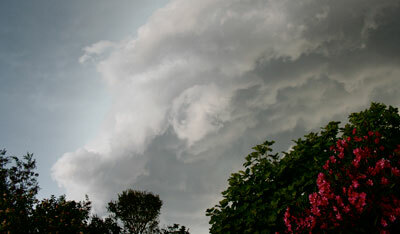 Mid July, we were in the garden when we saw a very ominous cloud formation gathering. It was rolling in like some George Lucas special effect, in fast motion. We realised that a storm was coming, but had no idea how bad. Dashing about, we closed shutters and the barn doors, just in time as the wind wipped up and hail, about the size of large peas, started to fall. It got more intense and the wind got stronger. Things flew past the window and suddenly the volume went up on the skylight windows. A pitter patter became huge crashes as we saw enormous hailstones smash into the ground. Coming in at a sharp angle they were getting under the roof tiles and we were scared that the windows would break. It was then that we realised that the cars were taking a beating and being damaged. Perry tried to leave the house and move them, but it was obviously too dangerous. These things were the size of mandarin oranges and were smashing through the ratan furniture in the garden. 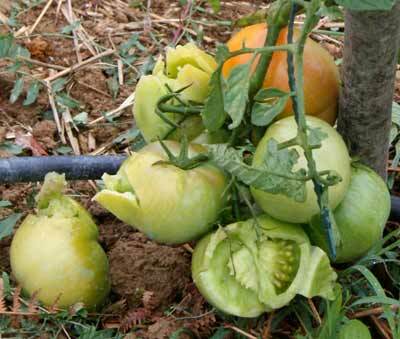 The fruit trees and vegetable garden were being pounded to a pulp. Caroline cursed out very loudly as she saw all her hard work being torn apart in a few minutes. All around us there are fields of cattle, sheep, ducks and chickens. They were all at the mercy of this bombardment, with no cover. We later heard that one farmer lost over 200 ducks. Stoned to death. Cows were injured with torn ears, open cuts and bruising. A few people were injured by flying hail as they tried to find cover. While watching this all go on outside, we heard a new sound. Water running. Looking up from the studio, we saw rain pouring in around the skylights (velux) on the mezzanine and on to Perry's drawings in his office. A mad dash for buckets, mops and anything that could catch water, we managed to move the spare bed and other furniture and place a line of recepticals and mop up the excess. The wind had been so hard, it had forced tens of liters of water up under the roof tiles and under the seals of the windows. Thankfully we were at home when it happened. After about 15 minutes, the hail became smaller and eventually moved on. We wondered about the ones ahead that were about to have this corridor of destruction sweep over them. When it was clear there was no more danger, we left the house and saw the state of the cars and the garden. Our neighbours all came out too and we convened in the field between our houses, exchanging stories and damage reports. 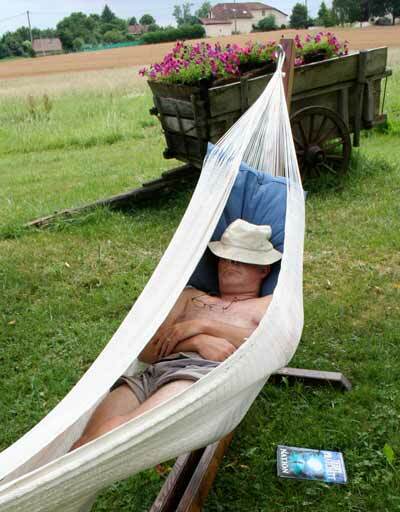 Our neighbour and friend, Alain, came round. He did our roof and wanted to know if all was OK. On closer inspection we saw that the new roof had about 40 broken tiles. The plastic piping for the drainage and WC were also pierced in several places. No one had seen anything like this before. The two barns were also badly damaged. In fact the large barn roof is now just a sieve in need of immediate attention. A job we were expecting to do within a few years, but now it's a priority. In the small barn, where we park the cars in the summer, the tiles had broken and fallen to the ground. If the two cars had been there, they would have had as much damage as being outside. Alain and his team came by the next day and replaced all they could. 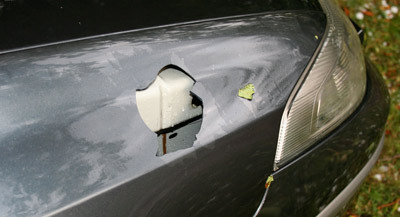 The insurer was also very quick to respond and pay out for the damage. A few days later, it was as if nothing had happened. Caroline cleared up the mess in the vegetable garden, which was completely obliterated, we cleaned up the smashed tiles and other debris that had been spread across the grounds. Perry got on with the house walls and the veggies all began to recover a few weeks later and start pushing new shoots. The wonder and power of nature is so much more evident in the country than the cities.